A new app feature, “Money Move,” enables iPhone and Android moneto users to send peer-to-peer money transfers to other moneto users free of charge. The moneto microSD card for Android now comes with 4GB of additional storage, and is supported on several new Android devices, including the Samsung Galaxy S II, Samsung Infuse 4G and the HTC Sensation 4G. iPhone owner can now purchases the iCaisse4X, an NFC-enabled protective case that provides full moneto mobile payments functionally together with an extended battery. The moneto X package with the iCaisse4X can be purchased for $79.96, while the original moneto iCaisse solution has been reduced to $59.95. Eech moneto kit comes with a moneto microSD, an NFC case or NFC antenna sticker applicator, a prepaid debit MasterCard, and $10 preloaded onto the account, according to DeviceFidelity. 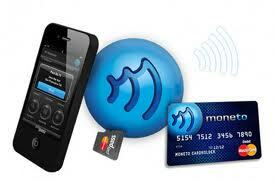 Customers can now use the moneto prepaid debit MasterCard with no monthly fees for the first three months. Each additional month where at least $300 is spent via moneto is free as well. For non-qualifying months, a fee of only $2.95 will be charged. DeviceFidelity says it will release additional new features for moneto in the coming months.